More often than not, most bands experiment with various sounds in their first few releases. 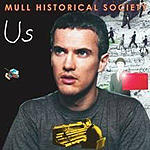 When listening to "Us", the new album by the one-man band that is the Mull Historical Society, you get the impression that maybe this was what he was trying to do. As a whole, the album is difficult to categorise. This is due to the fact that Colin MacIntyre jumps between genres for each song. The opening track 'The Final arrears' is reminiscent of Blur's arguably best era of "Modern life is rubbish". It is a catchy classic-indie sound and ends in a swirling dizzy combustion of noise. However, the next few songs do not live up to this high standard. Tracks such as 'Am I wrong' and 'Don't take your love away from me' fall into the more college-boy-learns-guitar-and-falls-in-love category. They are pleasant enough tunes and do their job, but do not compare to the first offering. 'The Automatic', however, swings the album back into the game. This infectious track deals with the acceptance of commercial culture and manages to say a lot in the short repetitious lyrics. This time, the full-bodied sounds of Supergrass at their best can be heard throughout. More songs like 'The Supermarket strikes back', which captures modern day culture excellently, follows. On tracks like 'Minister for genetics and insurance' and 'Clones', Colin's ability to freeze-frame a moment and an aspect of life is evident. His talent for seeing and writing about vivid symbols and "signs of the time" lifts this album a lot. At times, the album can be a little confusing as the songs jump a lot from really good to rather mediocre. Although more good than bad, the overall tone of this album is easily likeable, especially to anyone who still has a love of the Brit-pop era. Ultimately, there is a feeling that Colin wasn't really sure where this album was going, but for the better songs on offer, this one is worth a listen.